Log and share your equipment records. From anywhere. Systems maintenance is hard enough. But it gets even harder when you have to compile your images, readings, and notes, organize them in your PC or laptop, and send them to the rest of your team. With the new Fluke Connect app—which connects more than 20 Fluke tools to your phone—you can eliminate all of those steps. Automatically log and save your images and measurements, and share them with others you select from any location. It’s like having your team and your PC with you, no matter where you are on the plant floor. 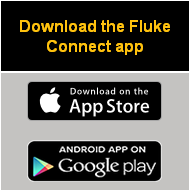 See how it works by viewing the Streamlining Predictive Maintenance video, and download the free Fluke Connect app today. Available from Contact Electrical Wholesale Ltd, For further information, Please Call 0121 359 5387.